Phylogenetic trees are constructed according to the evolutionary relationships that exist between organisms based on homologous traits. Phylogenetic trees are constructed using various data derived from studies on homologous traits, analagous traits, and molecular evidence that can be used to establish relationships using polymeric molecules ( DNA, RNA, and proteins ). Evolutionary relationships between animal phyla, or Metazoa, are based on the the presence or absence of differentiated tissues, referred to as Eumetazoa or Parazoa, respectively. Eumetazoa can be further classified into categories that are based on whether they have radial or bilateral symmetry, referred to as Radiata or Bilateria, respectively. Evolutionary trees, or phylogeny, is the formal study of organisms and their evolutionary history with respect to each other. Phylogenetic trees are most-commonly used to depict the relationships that exist between species. In particular, they clarify whether certain traits are homologous (found in the common ancestor as a result of divergent evolution) or homoplasy (sometimes referred to as analogous: a character that is not found in a common ancestor, but whose function developed independently in two or more organisms through convergent evolution). Evolutionary trees are diagrams that show various biological species and their evolutionary relationships. They consist of branches that flow from lower forms of life to the higher forms of life. Evolutionary trees differ from taxonomy which is an ordered division of organisms into categories based on a set of characteristics used to assess similarities and differences. Evolutionary trees involve biological classification and use morphology to show relationships. Phylogeny is evolutionary history shown by the relationships found when comparing polymeric molecules such as RNA, DNA, or proteins of various organisms. The evolutionary pathway is analyzed by the sequence similarity of these polymeric molecules. This is based on the assumption that the similarities of sequence result from having fewer evolutionary divergences than others. The evolutionary tree is constructed by aligning the sequences; the length of the branch is proportional to the amount of amino acid differences between the sequences. Phylogenetic systematics informs the construction of phylogenetic trees based on shared characters. Comparing nucleic acids or other molecules to infer relationships is a valuable tool for tracing an organism’s evolutionary history. The ability of molecular trees to encompass both short and long periods of time is hinged on the ability of genes to evolve at different rates, even in the same evolutionary lineage. For example, the DNA that codes for rRNA changes relatively slowly, so comparisons of DNA sequences in these genes are useful for investigating relationships between taxa that diverged a long time ago. Interestingly, 99% of the genes in humans and mice are detectably orthologous, and 50% of our genes are orthologous with those of yeast. The hemoglobin B genes in humans and in mice are orthologous. These genes serve similar functions, but their sequences have diverged since the time that humans and mice had a common ancestor. Evolutionary pathways relating the members of a family of proteins may be deduced by examination of sequence similarity. This approach is based on the notion that sequences that are more similar to one another have had less evolutionary time to diverge than have sequences that are less similar. Evolutionary trees are used today for DNA hybridization, which determines the percentage difference of genetic material between two similar species. If there is a high resemblance of DNA between the two species, then the species are closely related. If only a small percentage is identical, then they are distantly related. Phylogenetic tree of life: A phylogenetic tree of life, showing the relationship between species whose genomes had been sequenced as of 2006. The very center represents the last universal ancestor of all life on earth. 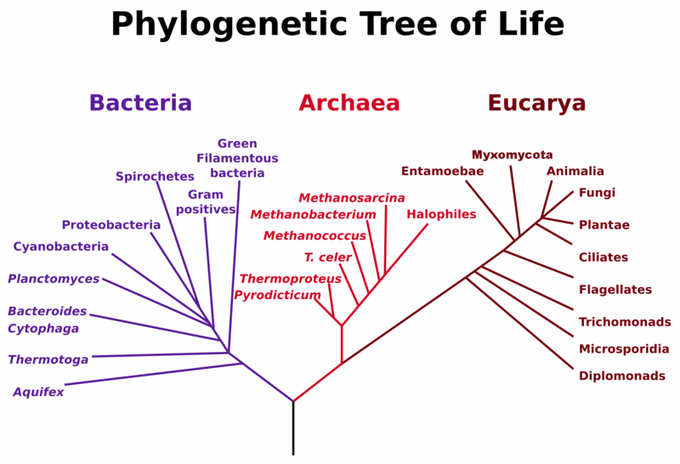 The different colors represent the three domains of life: pink represents eukaryota (animals, plants, and fungi); blue represents bacteria; and green represents archaea. The current understanding of evolutionary relationships between animal, or Metazoa, phyla begins with the distinction between “true” animals with true differentiated tissues, called Eumetazoa, and animal phyla that do not have true differentiated tissues (such as the sponges), called Parazoa. Both Parazoa and Eumetazoa evolved from a common ancestral organism that resembles the modern-day protists called choanoflagellates. These protist cells strongly resemble sponge choanocyte cells. Eumetazoa are subdivided into radially-symmetrical animals and bilaterally-symmetrical animals and are classified into clade Radiata or Bilateria, respectively. The cnidarians and ctenophores are animal phyla with true radial symmetry. All other Eumetazoa are members of the Bilateria clade. The bilaterally-symmetrical animals are further divided into deuterostomes (including chordates and echinoderms) and two distinct clades of protostomes (including ecdysozoans and lophotrochozoans). Ecdysozoa includes nematodes and arthropods; named for a commonly-found characteristic among the group: exoskeletal molting (termed ecdysis). Lophotrochozoa is named for two structural features, each common to certain phyla within the clade. Some lophotrochozoan phyla are characterized by a larval stage called trochophore larvae, and other phyla are characterized by the presence of a feeding structure called a lophophore. The process of establishing relationships between organisms is increasingly becoming more accurate due to advances in molecular analysis. The construction of phylogenetic trees is now based on similarities and differences within the molecular sources used for analysis which include DNA, RNA, and proteins. The ability to use molecular sources as a basis of phylogenetic tree construction has allowed for determination of previously-unknown evolutionary relationships between organisms. In addition to the establishment of new relationships within phylogenetic trees, the ability to use molecular sources for analysis has also created an emergence of new phlyums that were previously classified in larger groups. Besides identifying molecular similarities and differences between organisms, by assigning a constant mutation rate to a sequence and performing a sequence alignment, it is possible to determine when two organisms diverged from one another. The phylogenetic groupings are continually being debated and refined by evolutionary biologists. Each year, new evidence emerges that further alters the relationships described by a phylogenetic tree diagram. Previously, phylogenetic trees were constructed based on homologous and analogous morphology; however, with the advances in molecular biology, construction of phylogenetic trees is increasingly performed using data derived from molecular analyses. Many evolutionary relationships in the modern tree have only recently been determined due to molecular evidence. Nucleic acid and protein analyses have informed the construction of the modern phylogenetic animal tree. These data come from a variety of molecular sources, such as mitochondrial DNA, nuclear DNA, ribosomal RNA (rRNA), and certain cellular proteins. Evolutionary trees can be made by the determination of sequence information of similar genes in different organisms. Sequences that are similar to each other frequently are considered to have less time to diverge, while less similar sequences have more evolutionary time to diverge. The evolutionary tree is created by aligning sequences and having each branch length proportional to the amino acid differences of the sequences. Furthermore, by assigning a constant mutation rate to a sequence and performing a sequence alignment, it is possible to calculate the approximate time when the sequence of interest diverged into monophyletic groups. Phlyogenetic tree of life: Advances in molecular biology and analysis of polymeric molecules such as DNA, RNA, and proteins have contributed to the development of phylogenetic trees. Sequence alignments can be performed on a variety of sequences. For constructing an evolutionary tree from proteins, for example, the sequences are aligned and then compared. rRNA (ribosomal RNA) is typically used to compare organisms since rRNA has a slower mutation rate and is a better source for evolutionary tree construction. This is best supported by research of Dr. Carl Woese that was conducted in the late 1970s. Since the ribosomes are critical to the function of living organisms, they are not easily changed through the process of evolution. Taking advantage of this fact, Dr. Woese compared the minuscule differences in the sequences of ribosomes among a great array of bacteria and showed that they were not all related. For example, a previously-classified group of animals called lophophorates, which included brachiopods and bryozoans, were long-thought to be primitive deuterostomes. Extensive molecular analysis using rRNA data found these animals to be protostomes, more closely related to annelids and mollusks. This discovery allowed for the distinction of the protostome clade: the lophotrochozoans. Molecular data have also shed light on some differences within the lophotrochozoan group. Some scientists believe that the phyla Platyhelminthes and Rotifera within this group should actually belong to their own group of protostomes termed Platyzoa. Molecular research similar to the discoveries that brought about the distinction of the lophotrochozoan clade has also revealed a dramatic rearrangement of the relationships between mollusks, annelids, arthropods, and nematodes; a new ecdysozoan clade was formed. Due to morphological similarities in their segmented body types, annelids and arthropods were once thought to be closely related. However, molecular evidence has revealed that arthropods are actually more closely related to nematodes, now comprising the ecdysozoan clade, and annelids are more closely related to mollusks, brachiopods, and other phyla in the lophotrochozoan clade. These two clades now make up the protostomes.